TOKAJI.com .::. Buy Premium Tokaji Aszú : 2003 Tokaji Aszú 6 put. "Mezes Mály"
You are here: Home BUY TOKAJI Buy Premium Tokaji Aszú 2003 Tokaji Aszú 6 put. 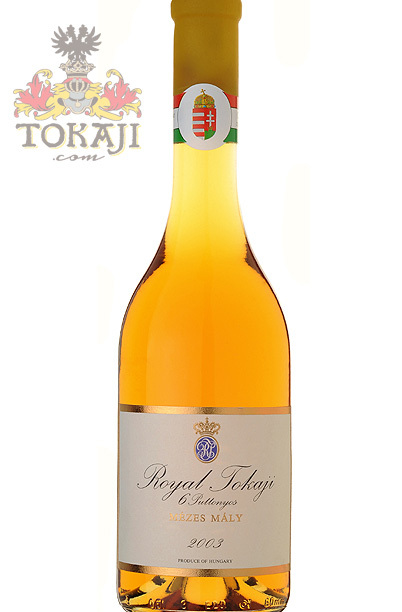 "Mezes Mály"
Producer: ROYAL TOKAJI WINE CO.
Mézes Mály near Tarcal is one of the two Great First Growths in Tokaj. In the text of the 1700 classification this vineyard stands out as the very finest - described as Pro Mensa Caesaris Primus Haberi - ‘to be the first choice at the Royal table’. 11 hectares of Mezes Maly are jointly owned by Royal Tokaji and Hugh Johnson. The French pioneering wine writer André Jullien (1766-1832), wrote in 1816 in his "Topographie de Tous Les Vignobles Connus" about this vineyard: "The wine of the cru of the mountain Mezes-Malé does not enter commerce; it is destined in its totality for the caves of the emperor and those of some magnates who posses some vineyards there."